A production by CONSTANZA MACRAS| DorkyPark and HAU- Hebbel am Ufer (DE). Funded by Hauptstadtkulturfonds and the Regierenden Bürgermeister von Berlin – Senatskanzlei – Kulturelle Angelegenheiten. Does everyday life in a metropolis pose a threat to the people? 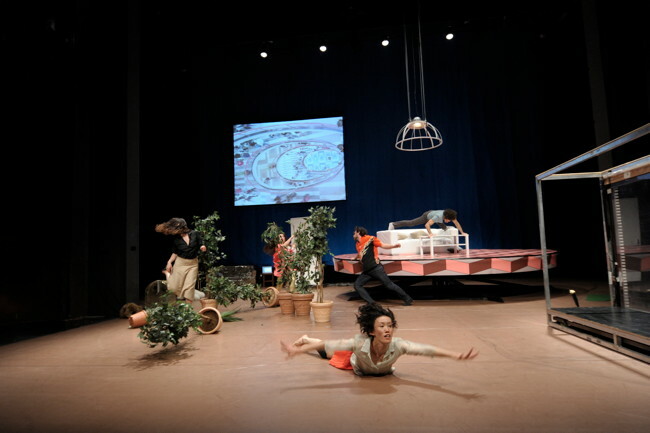 In HERE/AFTER, Macras along with four performers and one musician researched the nature of Agoraphobia - the fear of certain, especially public and vast spaces, as well as of masses of people – with all its peculiarities like hyperventilation, panic attacks, dizziness and disorientation. The piece deals with the anonymity and growing isolation of the individual in urban life. Never before has it been so easy to be “by oneself” in a society which makes a confrontation with the “outside” avoidable through the sheer endless possibilities of communicating via the internet, chatrooms and delivery services. In fact, what is out there that one absolutely has to experience live?